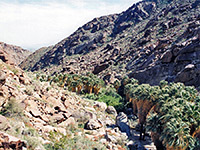 Borrego Palm Canyon is similar to several other east-west ravines at the edge of the mountains in the northwest of Anza-Borrego Desert State Park but it is by far the most visited, since it is close to the visitor center and has an easy trail running through; this follows a dry wash for 1.5 miles gaining just 500 feet in elevation, past many and varied desert plants to a big group of California fan palm trees - the third largest palm oasis in the state. Map of Anza-Borrego Desert State Park. 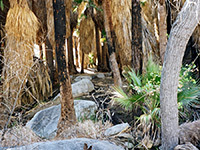 The Borrego Palm Canyon Trail begins at the main 117 site state park campground, reached by a spur road from the visitor center, and enjoying a pleasant setting amongst bushes close to the edge of the hills. 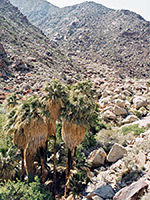 The path climbs gently up the alluvial fan at the mouth of the canyon and soon divides; both branches follow either side of the streamway, crossing several tributaries that join from both directions. 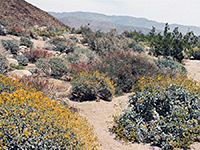 The land is quite open, covered by large and small boulders between which grow flowering bushes, and in spring the valley presents a colorful spectacle of yellow (brittlebush), red (chuparosa) and blue (indigo bush). Also abundant are the spiky, red tipped ocotillo, large barrel cacti, several species of yellow-blossomed opuntia, clusters of mammillaria cacti and a variety of smaller wildflowers. Wildlife that may be seen include lizards, snakes and the elusive bighorn sheep. The palms are reached after about 45 minutes walking, and are grouped around springs in the floor of the valley which at this point is quite narrow and sheltered. Climbing up the sides of the canyon is fairly easy and allows a rather different view of the palms. 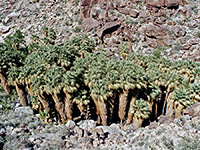 Apart from during rainy seasons, the water does not flow far before seeping below ground, but it does provide the year-round source necessary for the trees to flourish, and the cool, moist, shady area beneath the fronds offers a great contrast to the prevailing conditions of the exposed, sunny hike to reach the oasis. This is the end of the official hike but the canyon can be explored for several more miles; upstream it divides and the north branch extends right outside the park, into the adjacent Los Coyotes Indian Reservation. The terrain is more difficult higher up the drainage, with numerous minor obstacles formed by boulders and dense patches of undergrowth. 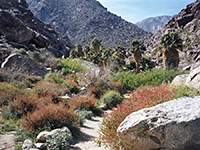 Other good hikes along palm tree canyons can be found near Palm Springs (the Indian Canyons), Joshua Tree National Park (Fortynine Palms Oasis, Lost Palms Oasis) and Kofa National Wildlife Refuge (Palm Canyon).